I sit here between stalls that sell Jesus on a t-shirt, knitted Jesus water bottle holders, a stand that sells the latest and greatest evangelic teachings, and even a stand that helps you bring Jesus into sport. 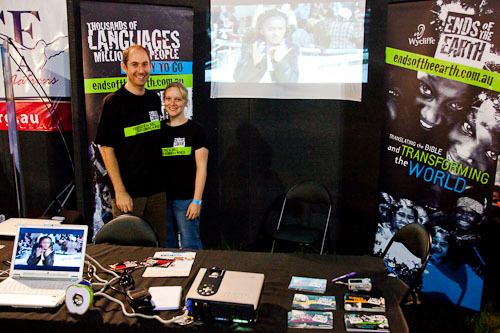 Our stand is just like anyone else’s – it has bright flashing lights, brochures, a projector with exciting videos, a computer scrolling through how people can help Bible translation. This isn’t enough. People don’t want Bible Translation, they want knitted water bottle holders and to change the world by wearing a Jesus t-shirt. Time and time again we’ve seen people just walk by because we aren’t selling anything. We aren’t giving anything away. We are just here, waiting for someone to come believing words are more powerful in a Bible than on a t-shirt. We sit here and wait. Does anyone come? Well, yes, we’ve had a few people interested. But the majority are people who already knew of Wycliffe already. This younger generation is tough to reach. Out of frustration I start saying “Don’t worry about this becoming a Bible Translator, it’s too hard, it requires too much commitment, it’s not for you”, what’s that? You’re interested now? So we should be here telling you that giving up your life for Bible translation is going to be tough and then maybe you’ll do it? Fine. We’ll stick with that approach for a while and see how it goes. You know what’s tough… what’s really hard? Sitting behind a Wycliffe stand and trying to convince a consumerist generation that the harvest is great, but the workers are few. Interested? Elyse enjoyed getting around the festival to take photos…. but be encouraged that some of the people at easterfest may have walked past because they’re already involved in doing something worthwhile. my wife and i were there and saw your stand, but didn’t drop in because our plan has been to go and serve with NTM with me being a support pilot. our plans may change, but we are willing and ready to serve God wherever he sends us. and remember that a lot of the kids who were there are going to grow up and mature in their faith, and once they’re out of school more of them may be interested in serving God longterm. it can be hard be hard because of our viewpoint and limited knowledge, but God does work in amazing ways in his own timing!